Sage 500 ERP, one of the most popular ERP applications, has been helping the various size and verticals of business to streamline their operations. Packed with functionalities like smooth integration with other business apps and user-friendly interface among others, Sage 500 has got almost all the features that one can expect from a traditional ERP solution. However, modern-day business challenges demand a lot more than that. Real-time monitoring of the business, remote accessibility, and collaboration among the users are some of the features that are now essential. To avail these features, a growing number of companies are switching to the cloud. Fortunately, there is a lot more than cloud hosting offers to the Sage 500 ERP. Business operations are not confined to the walls of your office, anymore. To outpace the competition, it is vital that you can access the updated ERP data on the go. 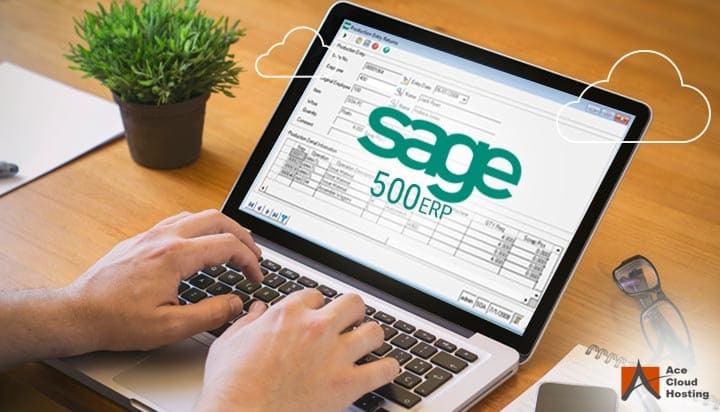 Hosting Sage 500 ERP on the cloud is the ability to maintain continuous connectivity among different data points. Cloud allows real-time access to files and data from anywhere with an internet connection. Utilizing this feature for consistent communication between employees and individual business units would greatly improve business operations overall. Sage 500 ERP hosting can provide businesses with updated and real-time data, allowing business owners to respond to the ever-changing business requirements immediately. As a business owner, you might be worried about your data security. Protecting the data requires not only significant efforts but also expenses that are spent on the deployment of hardware and software-based security methods. However, the cloud is one of the secure ways to store your data. Most of the hosting service providers offer enterprise-class antivirus, antimalware, firewalls and others to protect every bit of the data. Along with that, automated backup on the cloud server adds independence from the device, which eventually gives a more sense of security. For example, if your device is stolen or hacked, nobody can have access to your data without login credentials. When Sage 500 is hosted on the cloud, your data is more secure as third-party cloud providers ensure that your data is in safe hands. In the event of a disaster or natural calamity, your business productivity isn’t affected since there would be no downtime. Ranging from the government regulations to CSR activity, there can be various reasons why a growing number of businesses are looking for green practices. ERP is one of the software that consumes a significant amount of computing resources as it holds data for the entire firm and even all staff members might be working on it. Along with that, depending on the business it can require integration with different applications and add-ons. If Sage 500 ERP software hosted on the cloud, you can align the business operations to an eco-friendly model. Implementing green practices with the on-premise setup can be expensive as well as it may disturb the existing services, in a big way. Cloud computing, a proven method for green practices, adapts with the existing setup and resources. With time comes the change. As an experienced professional or business owner, you would know situations in the business change at a rapid pace. You may have to expand to accommodate the new employees or rising demand from the customers. Sometimes, circumstances might layoffs. Sage ERP should be able to adjust with the changes to control the business better. Cloud adds scalability and flexibility to your applications. When you host Sage 500 ERP on the cloud, you can add (or remove) the users, upscale (or downscale) the resources, such as – storage space, RAM, number of users, and others. Utilizing this flexibility, you can quickly switch to the new operational models and stay productive. On-premise or on-device operations of Sage 500 are vulnerable to several accidents, which could be a human-made or natural one. From the spilling of coffee on the laptop to a large-scale disaster, the possibility of disruption in services is always there. However, switching to the cloud means that you can keep working without any loss of time or data. Cloud-hosted Sage 500 is usually backed up on different servers to ensure that even in the case of troubles with one server, your services are reinstated on the backup server. Some of the hosting providers, such as Ace Cloud Hosting, offer SLA-guaranteed 99.999% uptime, which means less than 6 minutes of downtime. Who doesn’t want to save money? Cloud helps you achieve that as well. Even with all the features that we discussed above, the cloud can save you money in various ways and without any compromise on the quality of services. To begin with, the cloud doesn’t require to pay the upfront amount on the local infrastructure to install and process Sage ERP 500. Instead, you pay a rental to the cloud hosting service provider. The savings on the local infrastructure reflects in the form of real estate saving as well. Most of the hosting services offer support solutions as well, which means if you face any issue with the services, they are available to assist you. So, you reduce the expenses of maintaining a local IT team. Experience of using Sage ERP 500 on the hosted servers remains almost similar to the desktop version. All the features remain identical, and difference remains with the advantages of the cloud as you can access it from anywhere, anytime. To try Sage 500 ERP on the cloud servers of Ace Cloud Hosting, you can avail 10-days free trial now.